Wolf-Dieter Barz and Michael Galea (eds. ): Lectures on the Statutes of the Sacred Order of St John of Jerusalem: at the University (of Studies) of Malta 1792 by Antonio Micallef. Karlsruhe, 2012. 266 pp. Textbooks on Maltese legislation are few and far between, the earliest being dated to the first quarter of the 19th century. However, a study on the laws of the Order of St John, which regulated the Order itself, was published in Malta in the 1790s, only a few years before the Order’s reign in Malta came to an end. A Maltese Conventual Chaplain of the Order, Commendatore Fra Antonio Micallef, became Professor of Civil Law in the University of Malta in 1771 during the grandmastership of Manoel Pinto de Fonseca (1741-1773). He studied for the priesthood and was received as Conventual Chaplain in the Langue of Italy on October 8, 1753 (or January 2, 1751, according to the Ruolo published in 1788). He distinguished himself for his erudition and acquired a deep knowledge of the vast legislation of the Order and of the laws regulating the Maltese islands. At the Maltese Università degli Studi he imparted his knowledge and insight to his students. In so far as the laws of the Order were concerned, Fra Antonio took a practical view and decided to publish his lectures so as to avoid “the tedious exercise of dictating them and the students’ task of transcribing them”. His petition to print the lectures on the Statutes of the Order received the enthusiastic approbation of the Sacred Council and Grand Master Emanuel de Rohan Polduc (1775-1797). In 1792, the textbook came out with the title Lezioni su gli statuti del sagr’ordine Gerosolimitano nell’Università degli Studi di Malta per l’anno 1792. It was printed at the Order’s press, the only one existing on the islands. Wolf-Dieter Barz and Michael Galea have now had the brilliant idea of publishing an English translation of the lectures. As they aptly stated in their introduction, contrary to the linguistic situation in 1792, only some of the Order’s members are today conversant with the Italian language. Besides, in Malta itself, the local language and the widespread knowledge of English have pushed Italian into the background. As the compilers stated, the fascinating consideration of the Order’s legal history is its involvement as a constitutional unit in completely different legal spheres, namely the ecclesiastical, the Order’s own sphere, the international and the national (whenever branches of the Order exist). 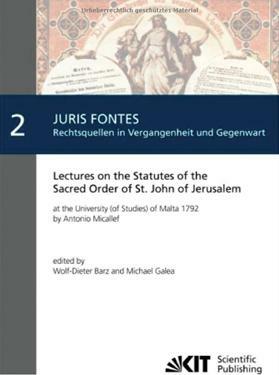 The last edition of the Order’s Statutes and supplementary legislation was published in Malta in 1782, under the auspices of Grand Master de Rohan. It consists of a folio volume of 505 pages. The Privileges of the Order had been printed in 1777 (128 folio pages). Fra Antonio’s lectures, now available in English, are a fantastic guide to all these massive tomes, supplemented by references to Papal Bulls on the Order, to judgments of Melevitana by the Sagra Ruota Romana, and to standard authors on international law. This is a book no member of the Order and no legal authority can afford to ignore. It is a masterly work by a Maltese jurist of exceptional ability. According to the editors of the book, Fra Antonio was born in Valletta on October 20, 1725, and baptised at the Collegiate Church of St Paul Shipwrecked. He was the son of Giuseppe Micallef and his wife Maria. As Conventual Chaplain, he served and officiated in the churches of the Order. He was the Almoner of the Holy Infirmary and also served on the Order’s navy during its sea voyages. The house where he lived, at the corner of Merchants Street with Old Theatre Street, still stands. The exact date when he ceased to lecture at the University of Malta is still to be established. By 1804, the professor of Civil Law at the University was the Rev. Dr Simeone Giuseppe Borg, who became a lawyer on May 2, 1789. Fra Antonio passed away on May 24, 1809, and he was buried in the crypt of Bartolott at St John’s Conventual Church. Readers of the book should keep in mind that the Codex published in 1782 is completely different from the Code of 1784. While the first one contains the Statutes and other laws of the Order itself, the latter lays down the civil, commercial and criminal laws regulating the Maltese islands. It is titled Del DrittoMunicipale di Malta, commonly known as the Code de Rohan: an update of the code of local law published by Grand Master Antonio Manoel de Vilhena 60 years previously in 1724. Indeed, Ferdinand de Hellwald in his bibliography places this code in the classification Lois et Constitutions de l’île de Malte. Quoting Hellwald, the compliers make reference to the second edition of the municipal code of laws published in Malta in 1843 with ‘annotations’ par Ant. Micallef, giving the wrong impression that he was the same author of the Lezioni. The annotations to the Code de Rohan were written by Dr (later Sir) Antonio Micallef, who graduated LL.D in 1829 and who later became President of the Appeal Court.